It’s easy to forget about your bathroom.. It’s the one room in the house that is neglected the most. A room which receives little attention. It’s probably about time your bathroom was given a facelift. It doesn’t have to cost a fortune. A little change can make a massive difference. It could be a simple bathroom sticker to make your guests laugh or a large bathroom mirror to make the bathroom space feel bigger. We have created 4 easy bathroom updates which are guaranteed to give your bathroom a facelift. Going to the toilet isn’t an experience which normally makes you laugh. That’s where the No Diving Vinyl Sticker for Bathroom Toilet can offer some assistance. The funny bathroom sticker can be placed on your toilet. It will ensure your guests leave your bathroom with a grin on their face and a lasting memory of your bathroom. Mirrors are a bathroom necessity. Choosing the right mirror for your bathroom can make all the difference. You want to choose a mirror which is going to complement your bathroom space. A large bathroom mirror will open up your bathroom space. An opulent oval designed mirror takes away the sharp edges of a standard mirror for a softer touch in your bathroom. Since the dawn of indoor plumbing, the toilet seat debate has existed. Should the toilet seat stay up or should it be put down? Men usually need it up, women always need it down. The debate never seems to end. Want some help in making sure the toilet seat is always down? 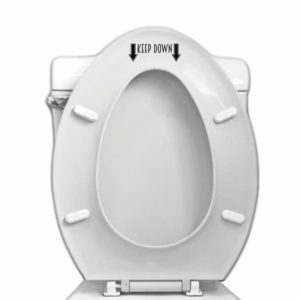 The Keep Down Sign Toilet Seat Vinyl Decal is here for you. A funny gentle reminder to make your toilet seat is always left down. Brighten up your bathroom walls with a new lick of paint. An easy facelift which can update your bathroom. Choose a colour which will complement the hardware and transform your bathroom interior. Although, paint isn’t your only option when it comes to redecorating your bathroom walls. Use a custom vinyl wrap to create a room accent and show off your personality into your bathroom. There are plenty of different ways to give your bathroom a facelift. Vinyl stickers can be used, apply them to the tiles in your bathroom or create a feature wall with some vinyl wall art. Browse our collection of vinyl stickers and decals here. Read our latest blog to learn how vinyl could help transform your living room. This entry was posted in Interior Design and tagged bathroom, vinyl stickers.